Hotel owner Loveridge fired by Payne for not being sufficiently indigenous. Correct us if we’re wrong folks, but isn’t this the same George Payne who while Minister of Tourism publicly dismissed Adrian Loveridge as the unanimously elected Chairman of the first Small Hotels Committee because he was not ‘sufficiently indigenous’? Is Adrian Loveridge hanging about on the web today? Can he confirm our memories are accurate? Racists cry Usain Bolt a traitor to his race: dates white woman. … Elizabeth Thompson, UN executive coordinator for the Rio+20 Conference didn’t really say that, but she and other racist members of her BLP government have made many similar racist statements before. Liz Thompson’s gut hatred of ‘Caucasian’ people is something that she has revealed on television and you can see the video on YouTube if you would like to judge for yourself. Click the links to read all about it! Island women everywhere were taken aback to see a photo of famed track star Usain Bolt kissing a white woman. Most were incredulous to learn that the world’s fastest man has been dating light skinned fashion designer Lubica Slovak for six months and the relationship is described as ‘very serious’. Former Barbados Environment Minister Elizabeth Thompson has not commented on the Usain Bolt romance, but screaming could be heard coming from her flat in Rio de Janeiro where she is UN executive coordinator for the Rio+20 Conference to be held this June. Those who remember her dismissal of environmental activist Richard Goddard as being unworthy of consideration because he is “Caucasian” will understand Liz’s horrific reaction upon learning that Usain Bolt is in love with a white. Reactions from other Barbados politicians came swiftly. Former Prime Minister Owen Arthur called Bolt “a negrocrat oreo“, while the former BLP Minister of Public Works Gline Clarke cautioned that the same group of “white, conservative, rich people” that he hates in Barbados probably arranged to tempt Bolt with a white woman. Clarke added that like Tiger Woods, Usain Bolt will probably come to his senses later. The only positive comment came from Barbados labour leader Sir Roy Trottman, who is rumoured to have given his blessing to the pair, noting that labour approval could be withdrawn at any time if it was discovered that Miss Slovak was a Jew. What part does race play in the community’s reaction to the Johan Bjerkhamn sentence? In a highly unusual comment, Magistrate Barbara Cooke-Alleyne publicly criticized Barbados DPP Charles Leacock (photo above) for dropping the manslaughter charge against Johan Bjerkhamn in the accidental shooting death of his son. Bjerkhamn’s actions on the day his son died came nowhere near the test for manslaughter. He blew his own hand apart as he was handling the Glock pistol, with the bullet traveling on to kill his own 11 year old son after passing through his hand. Stupid? Yes. A moment’s carelessness that he will regret for the rest of his days? Yes. But manslaughter? Give it a rest. It’s not even close. Coveted Christmas sentencing: Bjerkhamn’s case was adjourned to the coveted sentencing period of the few days before Christmas. This was a transparently manipulative technique to garner sympathy for the accused. It was unnecessary and on an emotional level almost made me want to see him thrown in jail just because we Bajans are tired of seeing the justice system played like a piano by the elites. Race might have played a role – in the calls to have Bjerkhamn imprisoned. Some of the reader comments here at BFP and elsewhere on the internet voice the opinion that the manslaughter charge was dropped because Bjerkhamn is white. When he originally left the island for medical treatment after the shooting there was widespread upset because some people, (including some BFP staff) believed he was given special treatment because of his status as a rich white elite. Now that the facts of the case are fully out in the open in court, it is obvious that the death of 11 year old Luke Bjerkhamn involved one careless moment – probably only a second – with none of the history or other actions and intents necessary to justify manslaughter. But some folks would love to see Bjerkhamn go to jail just for the pleasure of seeing a rich white elite behind bars. That, my friends, is a simple truth that is behind much of the ‘outrage’ over the reduced charges and sentencing. If you wanted to see Bjerkhamn in jail, look into your own heart and answer yourself truthfully… Did you just want to see one of them behind bars for a time? In the midst of our current economic crisis, one has to wonder how two decades of Bajan politicians’ hostile, xenophobic comments about whites, ‘curry boys’ (persons of Indian descent) and other foreigners have dried up offshore investment. Politicians like Owen Arthur and Gline Clarke fanned racial intolerance whenever it was politically expedient, but the internet has made everything public and forever available. How much of our current financial and investment problems are the natural result of the money and tourists going to friendlier places? MP Gline Clarke, former Minister of Public Works, expresses his disgust in Parliament that the current DLP government would do business with people of the white race. Question for Taan Abed and DLP Executive: Any truth behind this cartoon? Why did the DLP Executive Council overturn members’ choice of Taan Abed? A little over a month ago at the DLP Christ Church West constituency’s candidate nomination meeting, Taan Abed won an overwhelming victory (86 to 5!) over lawyer Verla DePeiza. The party leaders weren’t pleased that the constituency members soundly rejected the DLP’s anointed candidate, but that was no problem for the DLP leadership. The back-room boys stepped in and appointed DePeiza anyway. There. That showed those little nothing people who think they have a voice in Christ Church West! So much for democracy and so much for process. What a sham. Typical political elites: If the rules or the law are inconvenient, or the outcome isn’t what the big-ups want – they just tell everyone to get stuffed and do what they like. Been that way ’bout this place for a long time, maybe four hundred years or so. Why was Taan Abed’s selection overturned? Why did they bother to let him run in the first place if the whole selection process was a sham anyway? The party bosses were hoping that the constituency members would do the job for them, but when that didn’t work they stepped in. Why was Taan Abed rejected by the DLP backroom? 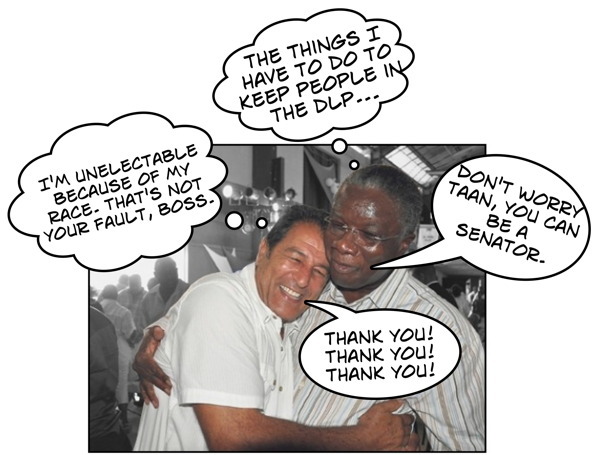 Could it be that they know he is unelectable in Barbados because of his race? It is rather so easy and opportunistic to hurl brickbats at Karl Watson (photo above) and the Barbados National Trust (BNT). But we should be mature and politic enough to recognise that the Trust cobbled together by the late Ronald Tree, the Bajan political elite and their courtiers was never meant to be a quango of serious clout to protect Bajan heritage. The politicians meant it to be toothless. It was never to be an organisation to influence public policy on behalf of Bajans and help in the retention and care of the heritage our ancestors left us. The trust was created no doubt with the best of intentions, but it is an insignificant sham. This is a truism that the BNT surely recognise. Karl Watson and his worthy colleagues must by all accounts be given the highest respect for what they have been able to achieve over the past years despite the restrictions imposed upon them by the big belly third rate politricksters who populate the talking shop in Heroes Square. Is Rawdi Adams’ skin dark enough to be elected in Barbados? Would Owen Arthur and the BLP welcome the son and grandson of two Barbados Prime Ministers into Bajan politics? Owen Arthur’s recent comments that if Barbadians elect a St. Lucian woman they are “without pride“ aren’t surprising in the least to those who know anything about the Leader of the Opposition. Oh yes. The old political fallback position for Owen Arthur and his supporters “Beware the whites”, and when that doesn’t work, it’s “Beware the Guyanese mango sellers” or “Beware the Chinese rat catchers”. In the recent past it’s been a proven winning political formula – but what damage it does to our future and our ability to progress as individuals and as a nation. Nothing new there. When Arthur isn’t cautioning against the whites and other selected races, he’s calling blacks who disagree with his policies “negrocrats” and other racist labels. 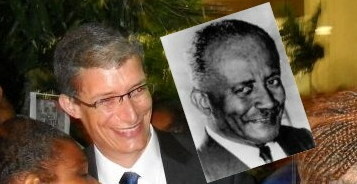 Which brings us to Rawdon “Rawdi” Adams, the grandson of nation-builder Grantley Adams (With Rawdi in the above photo) and the son of our second Prime Minister Tom Adams. Of late, Rawdi has been weighing into Bajan political commentary. Is Rawdi electable in Barbados or is his skin too light?